(Sleazy Records) 24 Tracks - Fantastic little box set containing 6 45rpm EPs with picture sleeves and liner notes. 24 songs from the deep vaults of Chess Records including some real rarities! One of Rock ’n’ Roll’s last living legends has passed away. The incredible Chuck Berry died March 18, 2017. The world of Rock music has lost its most influential pioneer, a seminal guitar stylist, the author of some of the most remarkable songs in Pop music history, and the inventor of the famous “duck walk“. Early influences were Muddy Waters’ earthy electric Mississippi style Blues, the powerful Rhythm ’n’ Blues of Louis Jordan, and Nat ’King’ Cole’s vocal style. Chuck Berry was born in St. Louis, Missouri, on March 18, 1926. 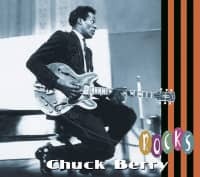 During the mid-fifties, he developed his own trademark style, transferring the Blues in Chicago into a new genre, propelled by his unique and sharp guitar riffs and his original songwriting. His simple but catchy guitar riffs had influence on generations of Rock guitar players. Without his brilliant ideas, his energy and songs, and his guitar playing, the story of Beat music in Europe and Rock music in general would have to be re-written. 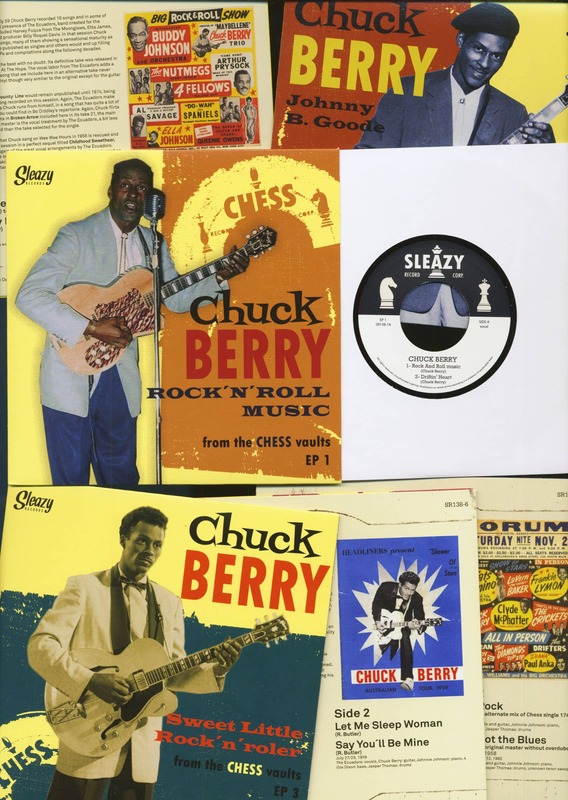 Both, The Beatles and The Rolling Stones, had quite a number of Chuck Berry originals in their early repertoire. Chuck Berry died in Saint Charles County, Missouri. – R.I.P. John Lennon said, "if you tried to give rock and roll another name, you might call it 'Chuck Berry'." How essential was Chuck Berry to the primordial development of rock 'n' roll? Without his mammoth contributions, the idiom as we know it now simply wouldn't exist. 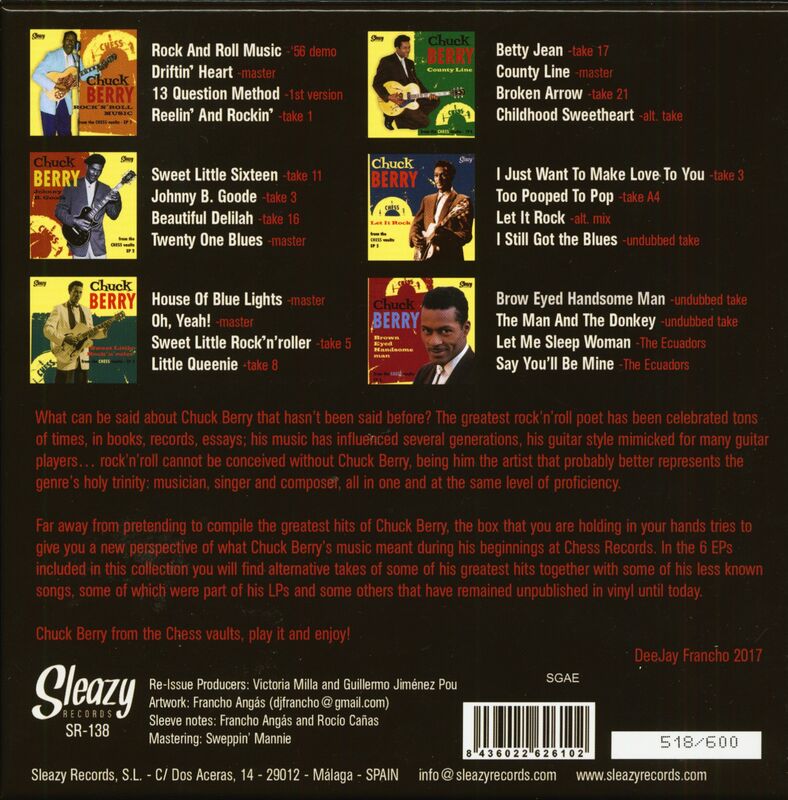 Sure, we can cite his essential early influences (Louis Jordan, T-Bone Walker, and a smidgen of Charlie Christian spring to mind), and there's no denying that there were precedents galore for Berry to draw from (the age-old debate about precisely what constitutes the first rock 'n' roll record will rage on for as long as anyone collects and reveres classic postwar R&B, blues, and country). But there can be little doubt that Berry devised much of the musical vocabulary that came to define the genre. Not only did he brainstorm the way rock guitar was supposed to sound, he captured and illuminated its rebellious teenage attitude through his extraordinary wordplay. He wrote virtually all of his Chess hits, a staggering accomplishment unto itself. For a generation of kids, Chuck was rock 'n' roll. He never made it onto 'The Ed Sullivan Show' during his '50s heyday the way Elvis did (considering the way Old Stoneface censored Presley's swiveling hips, the vision of Berry's guitar-thrusting splits and Duckwalk probably left him weak in the knees), but his legion of fans gobbled up each of his blistering Chess smashes the moment they hit the shelves. Countless bands covered his material, whether on wax or just onstage at local teen dances. When it came to filling a dance floor, Maybellene or Johnny B. Goode never failed to rock a house, no matter who happened to be playing them. The irony of it all was, Chuck was nowhere near his teen years when his debut single Maybellene catapulted him to immediate stardom in 1955. In fact, he was pushing 30. But he connected with the teenaged demographic so intensely, and his lanky, loose-limbed frame and acrobatic guitar antics looked so youthful, that no one ever questioned his emergence as a wry spokesman for their generation. 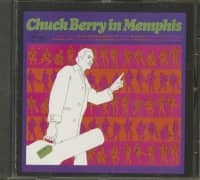 Souped-up hot rod Fords, high school cuties, and the pure, unadulterated joy of rock 'n' roll were the subjects Chuck sang about the most and identified with the closest, and the kids readily embraced him as one of their own. Berry's road to fame was not without its speed bumps and extended detours. Born October 18, 1926 in St. Louis, he progressed musically from the tame pop melodies he heard on his family's Philco radio by Kate Smith, Gene Autry, and Bing Crosby to the big band swing 78s of Tommy Dorsey, Glenn Miller, and Count Basie and ultimately to the blues platters of St. Louis Jimmy, Big Maceo, and Wee Bea Booze. A well-received performance of piano-playing orchestra leader Jay McShann's Confessin' The Blues at a 1941 Sumner High School assembly was a turning point. Berry had dabbled in piano at home (he hailed from a musical environment; his older sister Lucy was a promising mezzo-soprano), but here he was onstage, backed by equally young guitarist Tommy Stevens. That experience inspired Chuck to pick up an axe himself (Berry would revive McShann's tuneon Chess in 1960). He practiced on a four-string guitar on loan from a classmate, honing his chops and learning as many songs, both pop and R&B, as he could. Unfortunately, music wasn't enough to keep the teenager on the straight and narrow. A robbery spree across part of Missouri with two equally inexperienced accomplices in the autumn of 1944 culminated with the trio charged with car theft, which landed Berry and his pals in the Algoa Intermediate Reformatory for Young Men in Jefferson City, Missouri. Chuck sang with a gospel quartet and joined an R&B combo while in stir, serving nearly three years of his ten-year sentence before being sprung in October of '47. He returned to the Gateway City, got married, and started making inroads into playing music in local taverns, trading up from four strings to six and working hard on the physical schtick, utilizing his axe as a prop, that would enthrall American teens a few years later. Once Berry acquired his first electric guitar from radio musician Joe Sherman (Chuck was a janitor at WEW, where Sherman played live over the air), the die was cast. He took lessons from St. Louis jazz guitarist Ira Harris and grooved to the riffs of Carl Hogan, lead fretsman for Louis Jordan's Tympany Five. In 1952, Tommy Stevens invited Chuck to sing with his combo at Huff's Garden in East St. Louis, Illinois, a gig that lasted for half a year. Blues and calypso were part of their show, but Berry wasn't averse to breaking out a rousing hillbilly ditty, much to the surprise and delight of his audiences. Then pianist Johnnie Johnson gave the young guitarist a call, asking him to play that New Year's Eve at the considerably larger Cosmopolitan Club, another East St. Louis gin joint, with his Sir John's Trio. That call changed Chuck's life. "I employed him one night to work for me, because one of my original players couldn't make it," said the late Johnson, born July 8, 1924 in Fairmont, West Virginia (for the record, the absent musician was saxist Alvin Bennett, who had suffered a stroke and would never play again). Johnnie, who had arrived in wide-open East St. Louis only nine months earlier after playing in Chicago in a combo with bassist Milton Rector, alternated tried-and-true pop standards such as Stardust and Deep Purple on his trio's set list with earthier blues and boogie numbers. He recalled the novelty of Berry's genre-hopping fondly. "It was something new, and everybody was very interested in it, especially coming from a black guy playing hillbilly music." Drummer Ebby Hardy rounded out the trio, who continued on at the Cosmo with Chuck installed as the new focal point. 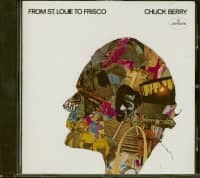 During a break from Johnson's employ, the dynamic guitarist starred at the Crank Club in St. Louis proper with his own combo under the paper-thin alias of Chuck Berryn to avoid the ire of his religious-minded father. In 1954, Chuck made his debut on wax as a sideman on a single for Oscar Washington's tiny Ballad label by Joe Alexander, known to his local fans as Calypso Joe. The record didn't sell a lot of copies, but at least it represented a tentative beginning for Berry in the studio. Chuck subsequently returned to gigging with Johnson at the Cosmo, his local star rising steadily. Having had an alluring taste of the studio life, Berry was eager to inaugurate his own recording career. St. Louis offered few opportunities on that front, but Chicago certainly had plenty. Chuck arrived in the Windy City with a buddy for a weekend's worth of club-hopping in May of '55. On the South Side, they encountered a marquee advertising Muddy Waters, the undisputed king of Chicago blues. "I was playing at a club at 3609 Wentworth, the Dew Drop Lounge,"
said the late Waters. "He happened in on me. He must have been up from St. Louis, wandering around." After Muddy finished his set, Chuck approached him and told him of his desire to make a record of his own. Naturally, Waters recommended the company that he'd scored so many hits for: Chess Records. "I'm the man that sent him to the place," said Muddy. "I give him the address, told him they open at nine o'clock, be there at 10. Tell Leonard Chess I sent him there!'" Berry followed Muddy's sage advice. He was waiting bright and early outside the Chess offices, then located at 4750 S. Cottage Grove Avenue, that Monday morning. Launched by Leonard and his brother Phil in 1950 (Leonard had previously operated the Aristocrat logo with other partners, Muddy emerging as his top artist), Chess boasted a star-studded talent roster led by Waters, the ferocious Howlin' Wolf, blues harmonica genius Little Walter, and the Moonglows. Leonard asked the tall stranger for a demo tape, so Chuck zipped back down to St. Louis and huddled up with Johnson and Hardy. Before week's end, he was back in Chicago, tape in hand. Leonard was particularly taken with a country-styled rocker titled Ida May, inspired by the hillbilly chestnut Ida Red. It's safe to assume no one had ever walked through the Chess portals with such a daring hybrid before. "The first time he came, he had practically the same songs (that he would record), but they was arranged different," said the late Chess house songwriter and bassist Willie Dixon. "He had more like a hillbilly style of things. After we listened to him quite a bit around there, we discussed it pro and con and reached a decision. 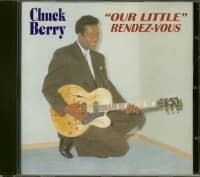 If he could change that to a different style from the hillbilly style, to make it a little bluesier…" On May 21, 1955, Chuck, Johnnie, and Ebby met Leonard and Phil at Chicago's top studio, Universal Recording Corporation on the near North Side, for Berry's all-important first session. Leonard wanted to get that bouncy country-styled song he was so fond of on tape pronto, but he instructed Berry to change its title. In his autobiography, Chuck claimed he thought of a cow he'd read about in third grade named Maybellene and deftly made the switch, while Johnson contended that Leonard spied a Maybelline mascara bottle sitting off in a corner of the studio and suggested the change. His little combo fleshed out by Dixon's hard-hitting upright bass and an energetic maracas shaker that may have been Jerome Green from labelmate Bo Diddley's aggregation, Chuck tore through Maybellene like he really was in a breakneck race with his two-timing girlfriend, relating a riveting tale of his V-8 Ford chasing her Cadillac Coupe de Ville on a rain-slicked back road. Chuck's blasting guitar solo midway through was downright startling in its imagination, execution, and sheer ballsiness; the parameters of rock 'n' roll guitar were being defined that fateful day at Universal. Released that July, Maybellene dashed to the top of the R&B hit parade the next month and remained there for 11 weeks. Perhaps even more crucially, Maybellene made a lofty #5 pop impression, no doubt boosted by the extensive airplay Alan Freed gave it over the WINS airwaves in New York (and no wonder: the label cut him in for a third of Berry's writing credit; ditto Chess landlord Russ Fratto). The industry hastily responded with covers by deejay Jim Lowe and country luminary Marty Robbins. Elvis performed Maybellene live in his Sun days; fellow rockabillies Buddy Knox and Gene Vincent later tried it on for size in the studio. That September brought competing answer songs entitled Come Back Maybellene by R&B stalwarts Big John Greer and Mercy Dee. But it wasn't until 1964, when Johnny Rivers cut a stripped-down live remake of Maybellene at the Whisky a Go Go in Los Angeles, that anyone else successfully cashed in on Chuck's initial triumph. A spectacular visual act who effortlessly did the splits mid-solo in addition to his trademark Duckwalk, Berry developed into a sensation on the rock 'n' roll package tours criss-crossing the country. "Alan Freed put us on his show," said Johnson. "We did 101 one-nighters across the country, from New York all the way to Florida. We was just doing those two numbers, 'Maybellene' and 'Wee Wee Hours.'" returned to Universal that September, Chuck carried another pounding country-tinged rocker in his guitar case, Thirty Days (To Come Back Home). Berry's gift for inventive rhymes and witty wordplay were in full bloom as he thundered through a tale of a lost love and his outlandish attempts to locate her (his faith in judges, the FBI, and the United Nations now seems ironic in light of his legal difficulties later on). There's a raucous call-and-response vocal hook in the main chorus, and Berry's blazing guitar solo is a stunner, his staccato picking sounding at times more like a mandolin than an electric guitar. Thirty Days wasn't quite the blockbuster as its predecessor, topping out at #8 R&B and seeing no pop crossover action at all. Ronnie Hawkins and his Hawks revived the rocker in 1959 as his first American release, Ronnie adding an extra 10 days to his deadline and calling the result Forty Days. It proved a mild pop hit. Berry and his crew squeezed in one more date at Universal before year's end on December 20. Among the highlights was the plug side of his third single, No Money Down, a major change of direction with its blues-soaked stop-time construction (it made an #11 R&B showing with no pop crossover early the next year). Here cool cat Chuck saunters into an auto dealership and audaciously orders up the car of his dreams, tricked out with a short-wave radio, TV, and a phone, as well as a "full Murphy bed in my back seat!" At the same session, Chuck returned to the open road for the rocking You Can't Catch Me, bragging about his unbeatable ride (he even outpaces the state cops on the turnpike) before describing a romantic tryst inside his fabulous vehicle (Maybellene gets a shout-out). For those fans who hadn't yet experienced him in person, Berry lip-synched the number in the film 'Rock Rock Rock!,' his distinctive look (wavy processed hair, white tux, and a small Gretsch guitar) and energetic antics (long legs flying throughout the song, he demonstrates the Duckwalk on the vamp out) rendering it one of the flick's highlights (the cast also included Freed as well as LaVern Baker, Frankie Lymon & The Teenagers, the Johnny Burnette Trio, and Chuck's labelmates the Moonglows and the Flamingos). 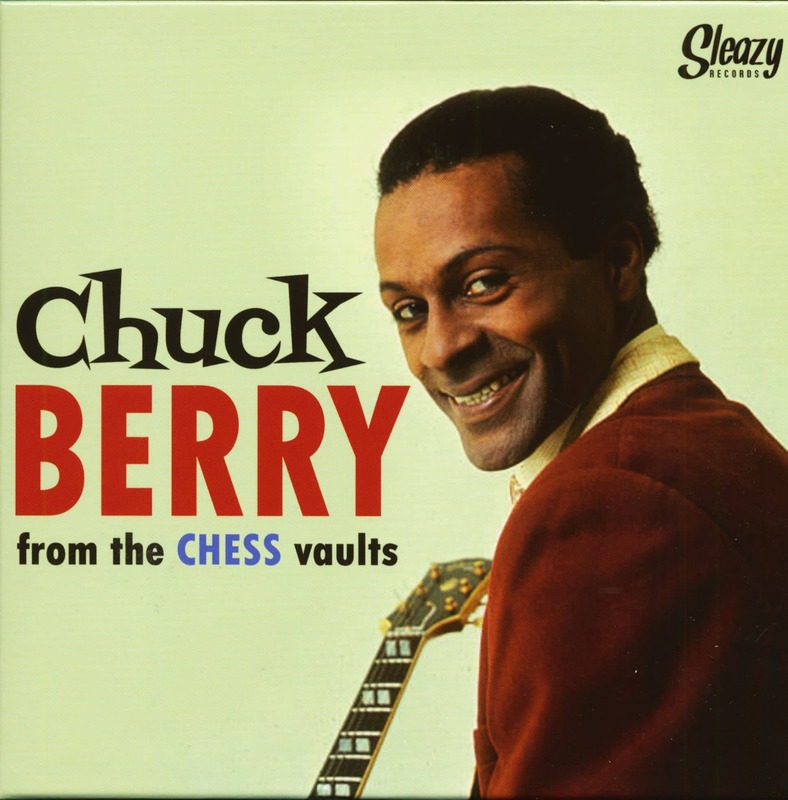 Customer evaluation for "Chuck Berry - From The Chess Vaults (6x7inch EP Box, 45rpm, PS)"
As always, excellent service from Bear Family. 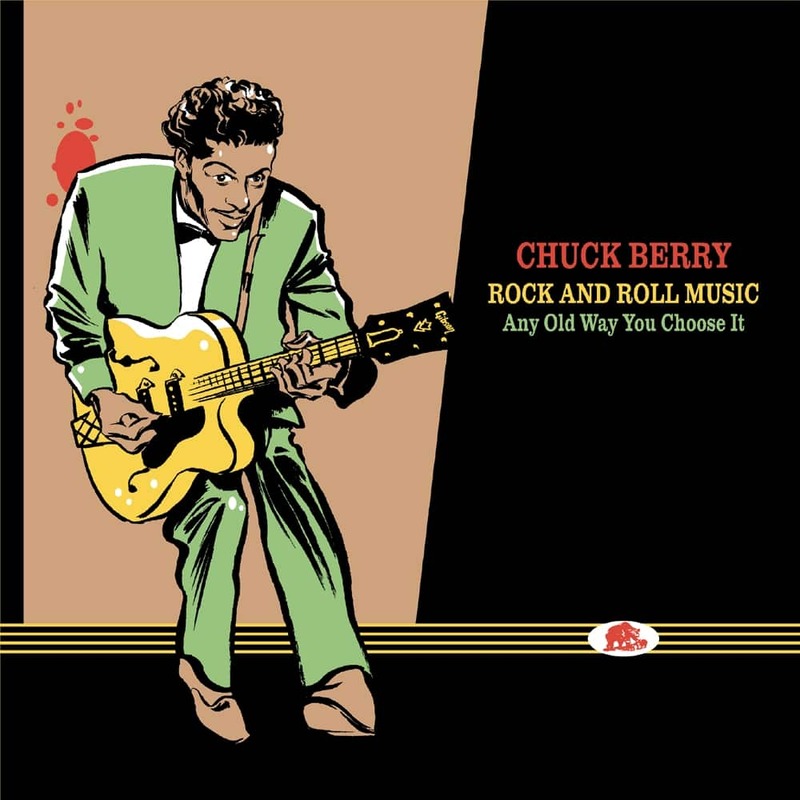 This Chuck Berry box is magnificent with beautiful period artwork and superb choice of songs/sessions. 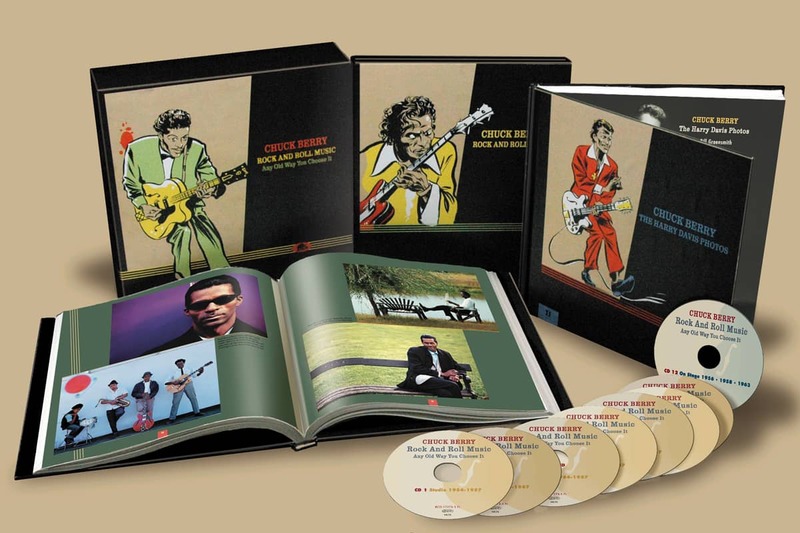 Endlich gibt es mal Outtakes und rares Material von Chuck Berry!